One the greatest advantages of this ever shrinking world is being able to read stories that break out of the "western" mindset. Initially The Throne of the Crescent Moon may seem like a traditional sword & sorcery that was a stable of fantasy in the 80's however look a little deeper and you will find something quite different. Not least is the fact that the story has a rich, middle-eastern flavour full of heretics, holy warriors, ghul's (assorted types of zombie) and magic. Sewn onto this rich tapestry is a cast of delightfully rich characters that while are clearly placed in the good and evil categories are also so full of the little foibles of humanity that they come alive from the page. The story unfolds through the eyes of a number of different characters, the 5 protagonists who make up the party looking to thwart a powerful sorcerer at large which has dark designs on the city Dhamsawaat. Firstly we've got the good Doctor Adoulla Makhslood, an aging ghul hunter and one of the last of his kind. His apprentice is the dervish (holy warrior) Raseed and travelling with them the young tribeswoman Zamia. They are soon joined by the Doctor's old friends Litaz and Dawood who become embroiled in this rich adventure. The switch between narrators is handled well although it did become a little confusing on the odd occasion, the timing is very intelligently placed however and breaks up the plot nicely. The authors voice is confident and the prose rich, vibrant and quite poetic in places providing a vivid picture for the reader. The pace is quite fast, although it does take a little time to build while the action scenes are dynamic and well played out. The world building is also quite magnificent, an Arabian styled world that teems with life and magic, very provocative and wonderfully rich - so much so that this world and the city of Dhamsawaat also act as another character in the story. The story itself is entertaining and rewarding with clearly defined bad guys and good guys, taken on face value you could say the the plot is quite simplistic but it fits perfectly within the setting and with the rich characters - a case of the sum being much greater than its parts. This story is further enriched by the tensions of the city itself, with a power struggle between the harsh rule of the Khalif and the dashing figure known as the Falcon Prince, a rebel leader who is as dangerous as he is charismatic. One thing I have to mention is the good Doctor himself, the character is simply inspired - an aging and world weary gent who has more of his life behind him than ahead and hasn't aged gracefully either. As a choice of principal antagonist it is so fresh and original that it's worth reading the story just for this character alone. 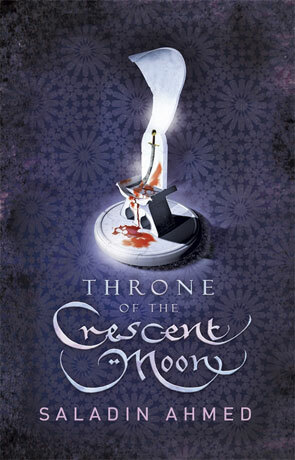 The Throne of the Crescent Moon has something of the epic about it, a wonderfully rich and vibrant tale that hits all the right notes, highly recommended. Written on 12th November 2012 by Ant.